Free Trade Ireland is an innovative web-based service, which encourages and facilitates the reuse of household and business items. The service is free to use and all items advertised on the service are offered for free. An Taoiseach, Mr. Enda Kenny, T.D. 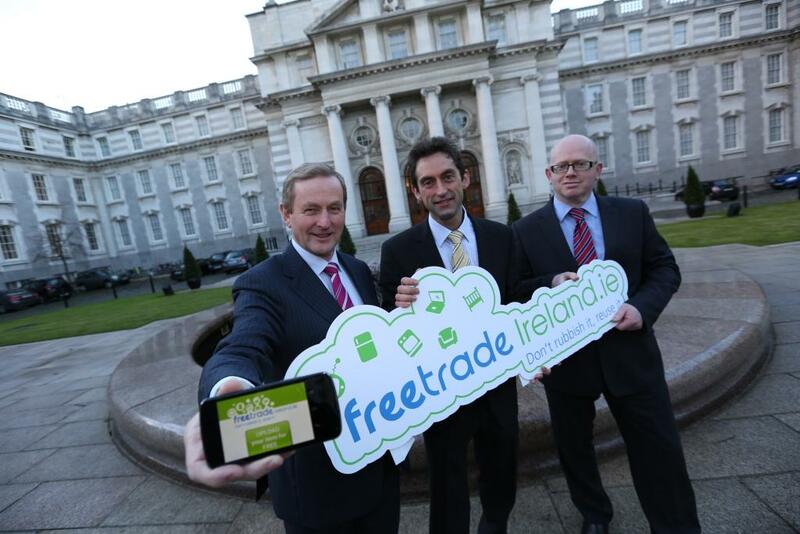 has launched a new smartphone app for www.FreeTradeIreland.ie, the national online reuse service. Reusing your unwanted items is now even easier and can be done through your smartphone in a few simple steps. iPhone, iPod touch and Android phone users can download the FreeTrade Ireland app for FREE from iTunes and the Android Play Store. The free app allows users the same functionality as the website so new users can register as a FreeTrade Ireland member, upload, search for and manage items. Users can use the app to upload pictures of their unwanted items to help find it a new home even faster! “It's particularly fitting that the new FreeTrade Ireland Smartphone app is being launched during the EU Week of Waste Reduction. This app should help people find new owners for items that are no longer wanted, while allowing others to find the items they need - for free. Everyone should be encouraged to save on the cost of disposal and on the cost of buying and, in doing so, cut down on waste. This is in line with the Government's policy of becoming a recycling society, by not only reducing waste but by realising the resources we can recover from waste” says An Taoiseach, Mr Enda Kenny, T.D. “The FreeTrade Ireland smartphone app is a fantastic new addition to the service and makes reusing items through the service even easier. The service gives items an extended lifespan and greatly benefits people in terms of time and cost savings, as well as reducing pollution on the environment,” says Hugh Coughlan, spokesperson for FreeTradeIreland.ie. The national FreeTrade Ireland service has been in place since July 2010 with Mayo County Council acting as the lead authority. In the three years FreeTradeIreland.ie has been operational, over three million visits to the website have been recorded and over 42,000 items reused. Items as large as mobile homes, cars, pianos, office furniture right down to smaller items like teddy bears, hair straighteners and golf clubs have received new homes through the FreeTrade Ireland reuse service. All items are welcome and all items are FREE! The Free Trade Ireland service is funded by the EPA under the National Waste Prevention Programme.